Jennifer O’Connell does some amazing interior paintings! This is an artist not afraid of color! 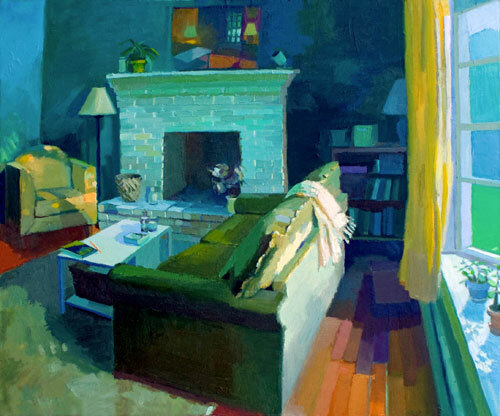 Her bold paintings really make a statement… I love the way she did the fireplace in this one, and the light streaming in the window, fabulous! Jennifer O’Connell grew up in the Adirondack region of upstate New York. She earned an MFA degree in painting and drawing from the University of New Hampshire and a BFA from SUNY Plattsburgh. Additionally, she studied fine art at the University College Chester in England on a Giltz Family Travel Award. After receiving her MFA, she was invited to show in the Young Talentexhibition in Washington Depot, CT. Since then, she has been the recipient of numerous awards including an Elizabeth Greenshields Foundation Fellowship, a Vermont Studio Center Artist Residency Grant, and a Massachusetts State Cultural Council Grant. She has led public lectures and participated in panel discussions on the East Coast. Visiting Guest Artist Lectures include Barton College in NC and SUNY Plattsburgh in NY. Her exhibition record includes national and international shows at Fraser Gallery in Washington, DC and the Bowery Gallery in New York, NY. In 2008, she was selected by juror Cynthia Reeves for the New England New Talent Exhibition at the Fitchburg Art Museum in Fitchburg, MA. In 2011, she was invited to exhibit her work at the College of William and Mary in Williamsburg, VA. Galleries that represent her include Adam Cave Fine Art in Raleigh, NC and Left Bank Gallery in Wellfleet, MA. She currently works and resides in Western Massachusetts. Kingsley Bate teak furniture… ahhh lovely!